Meniscus is a type of cartilage and there are two per knee: a medial (inside) meniscus and a lateral (outside) meniscus. They are located between the femur and tibia. They are shaped like the letter ‘C’ and work as shock absorbers, cushioning the joints. The cartilage assists in evenly distributing bodyweight across the joint so that excessive pressure does not build at any one point and cause arthritis. As it is weight bearing cartilage, the meniscus commonly suffers from wear and tear and is a site of frequent knee injuries. Meniscal tears can happen to people of any age group, but are typically prominent amongst younger athletes as well as patients in their 40s and 50s with some degenerative changes. Only the outside 1/3rd of the meniscus has blood supply and even this diminishes significantly after the age of 40. Thus, the meniscus becomes brittle as one gets older and can tear easily. Furthermore, because of its limited blood supply the meniscus has very little ability to heal itself. The inside or medial meniscus typically tears more often than the lateral or outside meniscus. Meniscal tears can manifest in a number of different ways. There are longitudinal tears, parrot-beak tears, flap tears, bucket handle tears, horizontal cleavage, mixed/complex tears and root tears. Root tears are devastating injuries and are not treated as regular meniscus tears. These tears are more common in middle age (45-60 years) patients who experienced a popping sensation in their knee. Meniscus root tears require a high level technical skill to repair and restore meniscus function to the knee. Without repairing the meniscus root, the knee will undoubtedly develop significant arthritis. Repairing involves putting sutures in the meniscus and reattaching it to the bone. Resecting or “cleaning up” a meniscus root tear will NOT help restore function of the meniscus and will still lead to arthritis. Squatting or twisting movements are common causes of all other meniscus injuries. Torn meniscus symptoms can include severe pain and swelling, stiffness, locking of the knee joint, and potential immobility. Meniscal tears are diagnosed using imaging technology such as MRI scans. Dr. Patel also offers in-office arthroscopy via Mi-Eye 2 which also is another way to diagnose meniscus tears immediately. Dr. Patel will look for the meniscus tear symptoms listed above when examining the knee. Immediate treatment for these injuries includes rest, ice, and elevation, in addition to the use of anti-inflammatory medications. In injuries not related to arthritis, meniscus surgery will be recommended to repair or resect the torn cartilage. 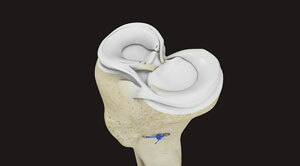 Meniscus tear surgery is performed using the arthroscopic technique. Repair of the meniscus is recommended to preserve the meniscus tissue and prevent arthritis down the line. Repair means putting stitches in the meniscus to bring the torn edges together. This requires 4-6 weeks of crutch use and bracing to protect the repair. On the other hand, removal or resection of the torn unstable mensicus tissue does not require sutures or any special protection after surgery. Patients are allowed to walk immediately after surgery without a brace. Meniscus surgery is performed in an outpatient setting -- coming and going home the same day and takes about 30-60 minutes to perform. The patient will be under general, regional, or local anesthesia. To perform the surgery, Dr. Patel will use an arthroscope, which is a small fiber optic instrument with a camera attached. The camera connects to a monitor which Dr. Patel will use to see knee joint and injury in detail. During the procedure,two small incisions are made around the knee joint. These are called portals. The arthroscope is placed in these incisions along with a sterile solution to expand the surgical area and give Dr. Patel space to perform the operation. Surgical instruments will be placed in the second incision. From here Dr. Patel will be able to identify the exact kind of meniscal tear, whether it is a medial meniscus tear, a lateral meniscus tear, or other. Depending on the specific injury, torn meniscus surgery will involve repair, partial resection, or total replacement of the cartilage. Meniscal replacement is also known as meniscus transplantation. Dr. Patel is one of the few surgeons in the area who is trusted to perform such complex surgeries. Meniscus transplantation places an entire new meniscus in the patient’s knee and is meant to preserve the knee joint from arthritis. Meniscus tear recovery time depends on the specific injury endured and the treatment plan recommended by Dr. Patel. For meniscectomies, or removal of the damaged meniscus, patients can begin walking right away and expect to return to their normal activity within 2 to 6 weeks of the operation. For more involved meniscus surgeries, in which the meniscus is not removed but repaired or replaced, patients will have to wait about 4 to 6 weeks to return to walking, and 3 to 6 months to return to their previous physical activity.